If you don’t watch Schitt’s Creek…seriously get on it. It’s on Netflix, you have no excuse. I’ve loved everything Eugene Levy and Catherine O’Hara have been in, so when their new show premiered, I immediately became obsessed. Eugene’s son, Dan Levy is a freaking GEM, as is the entire cast (Annie Murphy!!). This is my ode to Dan’s character, David Rose. He’s lovably snarky and strictly wears black and white. I bought face paint to do a little stubble beard, but Joshie was too wiggly. 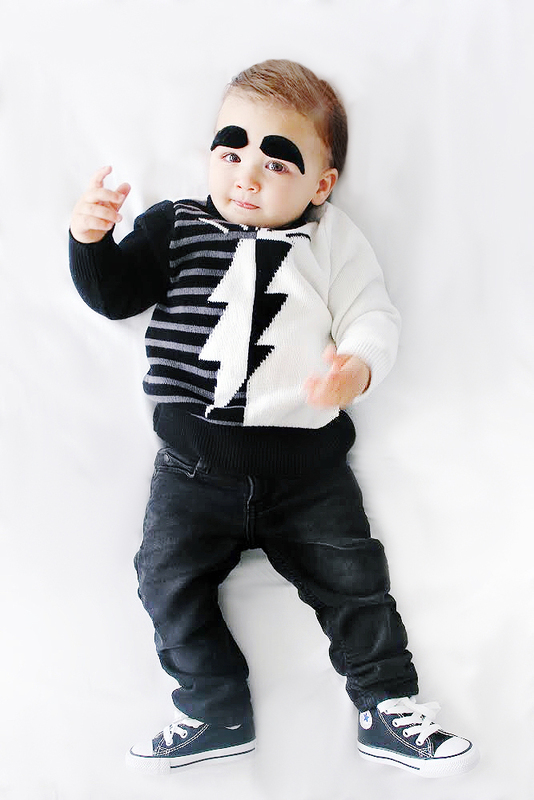 So this is like… David AS a baby lol! I found through making this costume that fake eyebrows are hard to find or don’t exist?? These are more Eugene Levy’s thickness, but you do what you gotta do. Now go watch!! Ew, David. Eyebrows – simply cut one of the mustaches in half!